In 1902 Colonel Andrew Duncan Davidson, an enthusiastic entrepreneur from Glencoe, Ontario, came to Saskatchewan in hopes of creating a 'midway' settlement between the cities of Regina and Saskatoon. With agriculture as one of his driving passions, Davidson through the Saskatchewan Valley Land Company purchased 700,000 acres (2,800 km2) from the railway and the federal government in an area where the soil was particularly suitable for grain farming. Davidson organized a train route that travelled from Chicago to Saskatoon; making one stop in Davidson on the way. This train route brought American bankers, entrepreneurs and newspapermen in hopes of starting up new businesses in the area. With the expansion of the community underway, Davidson also managed to sell more than 180,000 acres (730 km2) of land in the area. Within a short period of time, Davidson, which was declared the name of the community, was nicknamed the 'Midway Town' because of its central location. On November 15, 1906, Davidson was officially declared a town. During World War II the Royal Canadian Air Force built and operated RCAF Station Davidson as a component of the British Commonwealth Air Training Plan. The station was constructed on a site 7 km east of the town. This site should not be confused with Davidson Municipal Airport which is adjacent to the town, on the south end. Davidson Elementary School and Davidson High School were formerly part of the Davidson School Division, which also included schools in the communities of Kenaston, Craik and Eyebrow. As of January 1, 2006, DES and DHS are part of the Sun West School Division. In a small community, the school is at its core. This allows many opportunities for the community to get actively involved in the school and vice versa. Some of the partnerships between the school and the community include working for "Communities in Bloom," contributing to the recycling program at SARCAN, and planting trees around the newly established walking trail. Davidson School's mission statement is "Developing, Encouraging, Succeeding; Creating the Future"
The community newspaper is the Davidson Leader, publishing since 1904. Hockey, baseball, fitness, curling, figure skating, dance, gymnastics and riding are some of the activities offered to members of the community. Davidson has been dubbed as "The Community in Motion". Davidson is home to the nine-hole Davidson Golf and Country Club. A newly renovated swimming pool beside the local campground offers swimming lessons. 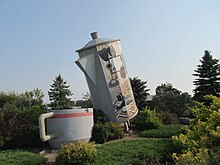 Coffee pot monument in Davidson, Saskatchewan. Approximately 24 feet tall, and would hold 150,000 cups of coffee - claimed to be the world's largest.Erected in 1996, and featured on a Canadian postage stamp in 2010, the town is now considering renovation of the monument. ^ National Archives, Archivia Net. "Post Offices and Postmasters". Archived from the original on 6 October 2006. Retrieved 23 September 2013. ^ Government of Saskatchewan, MRD Home. "Municipal Directory System (Town of Davidson)". Archived from the original on 15 January 2016. Retrieved 23 September 2013. 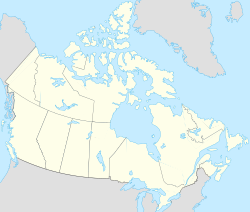 ^ "Peel's Prairie Provinces (Saskatchewan Valley Land Co.)". c. 1906. Retrieved 2013-09-23. ^ "The Canadian Encyclopedia (DAVIDSON, ANDREW DUNCAN) Volume XIV (1911-1920)". Retrieved 2013-09-23. 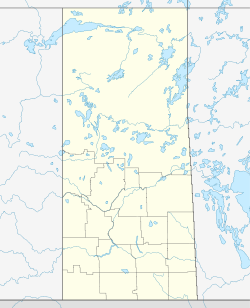 ^ "Davidson, Saskatchewan". Encyclopedia of Saskatchewan. Canadian Plains Research Center, University of Regina. 2006. Retrieved 2013-09-23. ^ Hatch, F. J. (1983). The Aerodrome of Democracy: Canada and the British Commonwealth Air Training Plan, 1939-1945. Ottawa: Directorate of History, Department of National Defence. ISBN 0660114437. ^ "2011 Community Profiles". 2011 Canadian Census. Statistics Canada. July 5, 2013. Retrieved 2012-09-11. ^ "2006 Community Profiles". 2006 Canadian Census. Statistics Canada. March 30, 2011. Retrieved 2012-09-11. This page was last edited on 8 June 2018, at 18:43 (UTC).